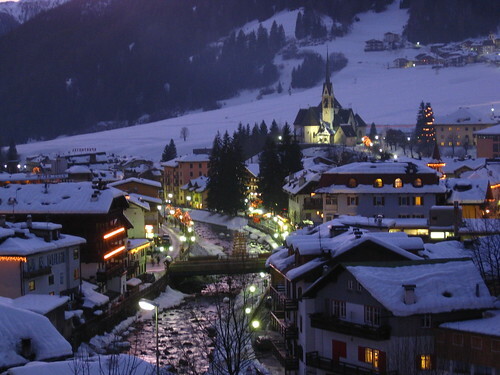 The Val di Fassa is located in the Dolomites, the beautiful mountains surrounding the northern part of Italy. This valley is located in Trentino Alto Adige and the people here still speak Ladino, in its most popular variant: the Dolomite Ladino. This is a real paradise for snow lovers. 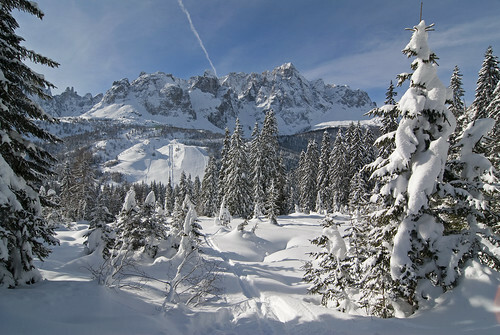 Nature offers over 200 km of ski slopes around which equipped structures and qualified staff have been set. Among the most popular winter sports there are: cross country skiing, snowboarding, off-piste skiing, alpine skiing, night skiing, ice hockey and ice skating. This is a lovely village with about 1800 inhabitants, situated at 1450 meters above sea level. Canazei is not only a charming village in the Dolomites, well-equipped for tourists and build with the typical houses of this area. This area is very pleasant both in summer and in winter. It is close to the massif of the Marmolada and the main ski centres and the major hubs for hiking and walking trails are easily reachable from here. In Canazei there also are some churches of great artistic value such as the Church of St. Florian, dating back to 1500 with decorations and artefacts in the Baroque style; the Church of Saints Sebastian and Rocco in the Gothic style with two altars of great value; the Church of Anthony also in Gothic style, dating back to 1400; the Church of the Sacred Heart, built during world War II; and the Church of Our Lady of the Snows, dating from the sixteenth century. Another famous centre of this area is the town of Moena. Moena is located in a valley and is surrounded by one of the most fascinating and breathtaking views of the Dolomites (Latemar, Valacia and Costalunga groups). Moena was called “the fairy of the Dolomites” for its beauty and for the its position that creates a magical atmosphere. 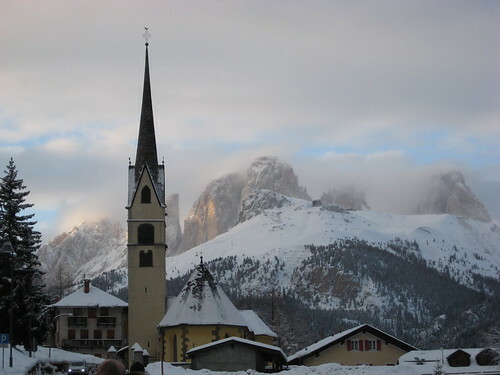 It is the most populated city in the Val di Fassa and it is about 1150 meters above sea level. One of the most popular view in Moena is that of Enrosadira. 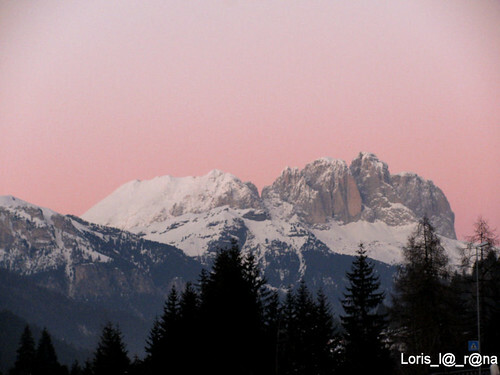 It is a natural phenomenon that occurs at sunset when the Dolomites peaks around the city become violet – pink. Then the landscape appears enchanted and magical …and then why could not the fairies fly? Moena has one of the biggest historic center in this area. This is full of buildings testifying its past as Ramone’s House or House of Duty. Among the monuments of Moena 2 churches in particular are interesting: the old church of St. Wolfgang, built around 1000 and decorated with frescoes of 1400. This church is dedicated to the patron saint of lumberjacks. Another interesting church is that of St. Vigil, also decorated with frescoes.